Software, outsourcing, service bureau, co-employment, ASO, PEO… it’s little wonder the market for payroll solutions has a reputation for being confusing and hard to navigate. Where does one solution end and the other begin? And how do you know which one you need? 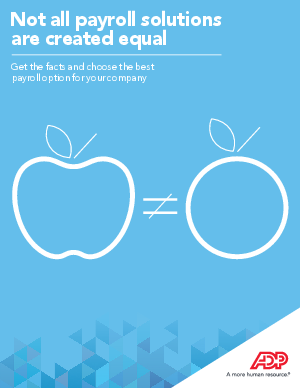 This complexity is the reason we’ve created this simple guide to your payroll options. Before you start comparing vendors, you need to decide which payroll style is best for you. And before you make that decision, you need to know what you want in return. Are you looking to save money? Save time? Eliminate errors? Do you want help minimizing tax compliance risks? There are plenty of options available, and they all come with different pros and cons.